32 London Bridge Street, London SE1 9SG is better known as The Shard. It’s Europe’s tallest building and it became a worldwide household name, even before it opened! When you step out of London Bridge Station the Shard is on the left, but strangely the main entrance is down an open-air escalator to a covered walkway called Joiner Street, and opposite a small flower shop. I walked past it twice. But as the London Bridge Quarter is undergoing a £2bn regeneration project, I’m sure that this will change very soon. In the main foyer, a line of drawings show famous people in playful cartoons, including the Duke & Duchess of Cambridge as Pearly King and Queen, and Richard Branson selling hotdogs, plus Henry V111 marrying Kate Moss. I couldn’t help wondering what Henry V111 would have thought of The Shard and being able to view the whole of London at once. A special composition by David Mitchum, played by the London symphony Orchestra accompanies visitors through the attraction. It was supposed to end with a crescendo at the top, but it didn’t. Four lifts take visitors to Level 33, the Transfer Zone where we changed lifts. There’s a map of the Thames woven into the carpet with 200 sentences and questions on the walls and floor. On the wall is a live map of The Shard, showing the underground trains moving around below it. Up we went to the Cloudscape on Level 68. The glass is slightly obscure as it was discovered that people would get out of the lift and rush towards the windows. So we walked up the stairs to Level 69. We were so lucky with the weather. The views in every direction were perfectly clear, but hazy.. 12 ‘Tell:scopes,’ ultra high-tech digital telescopes are placed around the room. They can identify over 200 famous landmarks and places of interest, offering information about them in 10 languages. We went even higher, to Level 72. This is the highest public level of the building. It’s partially open-air and surrounded by the giant shards of glass that form the top of The Shard. I don’t suffer with vertigo, but sometimes when I was taking photos upwards I was glad of the handrail to hold on to. I think there was too much going on to worry about it. What did I think of my experience? The whole thing is very well-run and there are plenty of helpful staff around who are all very knowledgeable. But I did feel a bit sorry for the young lad in the lift. All that lovely view and he sits in there all the time! The main architect Renzo Piano described the development as a ‘shard of glass.’ The design was influenced by the irregular shape of the site. It’s based on the masts of the ships that used to anchor in the Thames, plus London’s church spires. The plates of glass incline inwards but don’t touch, and are open to the sky. 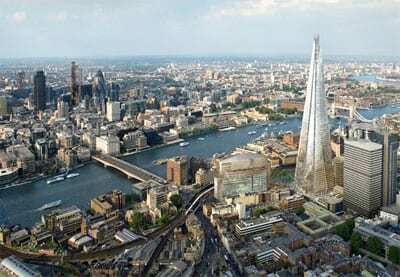 The Shard is described as a vertical city. 95% of the construction materials were recycled materials. It will contain office space, 10 exclusive residences; Europe’s highest homes; a 5-Star Shangri-La Hotel and spa, with a swimming pool on Level 52. The Sky boutique on Level 68 is the highest shop in London. There will be several restaurants, all with spectacular views over London. And of course, there’s London’s highest viewing galleries, The View from the Shard. It’s due to open to the public on Friday 1st February, 0900am-22.00 pm..
Tickets & gift certificates are £24.95 for adults and £18.95 for children. Tickets are booked in advance and carefully timed. A limited number of ‘walk up’ tickets are available. My advice is, take a risk and go for the ‘walk up’ tickets. It’s a very high building and there will be days when the view is obscured. I didn’t see it at night, but I bet it’s spectacular!